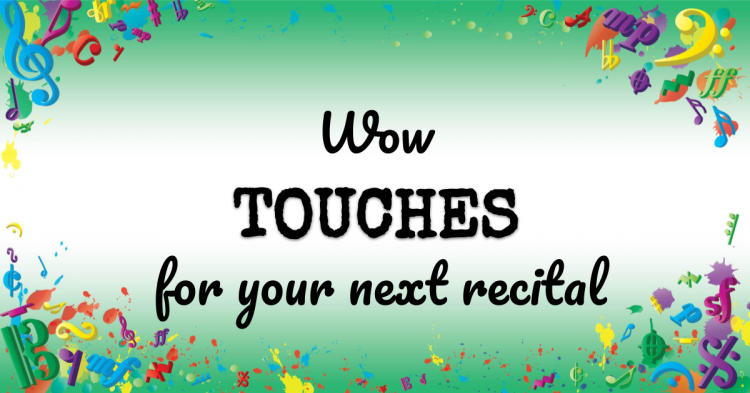 What takes a recital from alright to totally WOW? It’s the little things. Get inspiration and ideas for how to make your next recital sparkle in this episode. How to make your studio recital into a CELEBRATION! This is Episode 21 of the vibrant music teaching podcast. I’m Nicola Cantan and in this show we’re talking about how to take your recitals up a notch. So in the last show we talked about the basics of recitals setting everything up getting everything in place and generally avoiding stress as much as possible by following a checklist. And that’s awesome. And as I said in that episode which you can find by the way at Vibrantmusicteaching.com/20. As I said in that episode if this is your first recital stick with that. Do the basics get competent with it and then you might like to consider some of these things down the track but keep it simple. Get fancy later. Now if you are ready to get a bit fancy then this is the episode for you and if you’re not then this is the day to look forward to in the future. If you do something really special at your recital it can be the most fantastic catalyst for your studio’s growth reputation and just how much your students enjoy being in lessons with you. It can be a fantastic opportunity for amazing marketing photos and word of mouth opportunities where parents just rave about you to other parents and words spreads quickly among parents so you may want to consider adding in something extra special for your next recital. But where do you start. There are so many options. Well I’m going to talk you through the various things you might consider and I’d love to hear more options from you guys so if you go to today’s show notes there’ll be a vibrant music teaching dot com slash 21 that’s the numbers by the way 21 then leave a comment there and let us know what you’ve done to make your recital special cause these are not the only ideas that I’m sharing with you today. There’s certainly other ways you could go but I’m going to talk you through some of the main ones that I’ve tried or seen other people try. The first one and the most common one that I see is themes. Now it could be any type of theme but that’s the most common way I see people spicing up their recital a bit is they add some kind of a theme. It could be like under the sea or Disney or anything like that pirates it could be any kind of theme that you might set for example for a party. Right. Or it could be a particular genre of music or a particular composer or all women composers or all composers from a particular era. I know Leila Viss I think did a Leila Viss from 88 Creative Keystart dot me I believe is her website. I’ll look that up and put it in there in the show notes. But she did a baroque recital. And I think something like that would be fantastic. So there’s so many different ways you could go with themes but I feel like that’s the one that’s talked about the most. 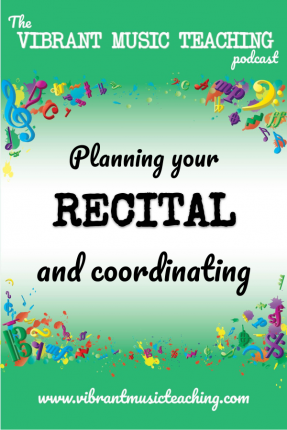 So I’m not going to dive too much into the different options for themes here but it’s certainly a great way to make your recital that little bit more interesting and exciting for your students. The next way is simply using the repertoire in a different way to setting a theme with it that you do something a little bit different with the pieces your students are actually playing. One thing I do is every year my January recital is called the January jam. It’s very much not really a recital. It’s kind of an informal concert. It’s in my home studio which is just my living room so it’s not a huge room. I can fit about 30 people in there. So it will be groups of 10 students roughly and their parents and at the January jam we focus on creativity. I call it the creativity showcase. So there are creative elements to my other recital as well. But in this one every student either improvises plays an ensemble piece with another student or plays an ensemble piece with like a backing track or an app or something like that. So it’s very much focused on creativity and collaboration. And there are different ways we do the improv as well so we either do some students will do a pattern which is from first Kinney’s books create first or pattern play either of his books have great patterns in them. Another way we do the improv is to have them make an improv sandwich which is where they take their piece. Usually a shortish piece and it needs to have a strong left hand chord-based left hand is generally what works best although would work fine if the chords were in the right hand if it was the melody in the left hand that would be fine too. So generally we take that short piece and the first step with the sandwich the first piece of bread as I call it is just the piece they play at once and then they repeat the piece. But this time they keep just the harmony. Normally the left hand and the improvise with their right hand using the pen scale they were using or the scale they were using for that piece. Then they go back to the start again for a third round it’s time they play the melody but with embellishments and I call that the top piece of bread with the sesame seeds on top because it’s got a little bit of sparkle to it. So that’s how we create our improv sandwiches are there are many different ways you could do that but that’s what we do in the January Jam is everyone is doing something creative or collaborative. And it’s a much more informal performance opportunity although I have to say my spring recital is not what most people would call formal either. And we’ll get to that in a moment. So you can do that type of creativity showcase with your repertoire. You can take different themes with it. You can also just incorporate one amazing ensemble piece something really fun and interesting. Or I mean it doesn’t even have to be that fancy. One thing I’ve done previously is I had all my beginners and you can find videos of other people doing this as well on YouTube if you do a search. I love coffee is a piece in the beginning of piano safari OK. If you don’t use pianos don’t worry you could do this with many other things but piano safari happens to come or I love coffee rather happens to come in six parts and I did it as a relay. Now I did it with three students so each student played two parts. So let’s say student A’s play part 1 then student B plays part 2 and student C plays part 3 and then they repeat student 1 student Hey play is part 4 you get the idea. I’m talking myself into a circle here but you think you get the idea behind that. So all the while I’m playing the duet accompaniment but the students are cycling around like a relay. I’ve seen a video on YouTube where they’re doing it with six students. You could do it with two. You could do with however many you have or you could get your students all playing I love coffee simultaneously. Six of them at one piano could be madness. It would be really fun. So having just one fun ensemble piece like that can be a great addition. You don’t have to do really fancy stuff here just something to make your recital sparkle. Another great way to do that is with pieces that involve audience participation. I know Wendy Stevens composecreate.com have several of these where the audience has to do something and I believe there’s also been some in Teach Piano Today’s book club which is that PianoBookClub.com. So if you can find pieces like that where the audience have to clap at a certain point or do a sneezing sound or all sorts of funny things that could be a great moment for your recital as well. Another thing that you may have seen around the blogosphere as it were around piano teaching blogs is the complement exchange. This is where parents and students who were in the audience fill in a little compliment about each student’s performance or just certain ones that they select. I did this one year and I had it for them do it for every single student because I was worried otherwise that everyone would pick the more interesting intermediate students and the beginner students might be left with no. So I did it with all of them and I’ll pop a link in the show notes to where I blogged about that as well. So that’s just a way of getting your students some great feedback and also carrying it forward into the weeks after the recital because they get to look back at those great compliments from everyone and sort of enjoy the glow of that performance for a little bit longer. Now last year at my recital I wanted to get the audience to be a little bit more lively and so I thought about giving them noisemakers and actually not noisemakers party blower’s and the only reason I didn’t was I literally couldn’t find them. Can you believe that. I thought that would be so easy to find in like a year or two like a budget dollar store type of shop. No I couldn’t find them anywhere so I didn’t do that. I know it would have been slightly madness anyway. What I landed on though was as I was exploring and looking for these party blower’s tiger which is if you don’t have tiger in your country it’s like a sort of trendy dollar store shop. It’s like Scandinavian but it’s old to euro anyway. So Tiger happened to have pompoms and I thought OK this will be great. So I gave all the students basically all the kids as they came in got a pompom each which they were to wave during the applause and they explain this all at the start and reiterated and practiced it with them before we started their recital proper. And then I went around and strategically gave a certain very trustworthy students a percussion instrument. So just like a shaker or a tambourine or something I have a few of those around so I brought a box to them and I just gave them to the ones who I knew could hold it still when there was no applause. And I warned them to do that as well. That worked so well. I really enjoyed that and it might become an annual tradition. Of course I might come up with some other wacky idea before we get May but the pompoms are really fun. I like the audience being colorful. And since my studio is cold colorful keys that was a really fun addition for us. And it it just made it more of a celebration which is what I that’s what I said to parents at the time and that’s really what I want. The recital to be. It’s a celebration of all that they’ve learned during the year. It is not a performance or a test of anything or you know it’s not something like that. It’s a celebration of all the amazing progress they’ve made. And I wanted it to feel more like that. So those pompoms worked great. You can actually see a video where I explain more about that on my Facebook page. So that’s Facebook.com/colourfulkeys and you’ll see in the video section there. I’ll leave that link again in the show notes. But it’s all about what I did at that recital. Another thing which I have not tried to make my recital more exciting I haven’t done this, this would be so fun and I know many other teachers who have done it and it really would be fantastic is to organize a sort of band experience to bring in musicians probably professional musicians who can sort of adapt to your students playing and have them play along with the band. Now one of the reasons I haven’t gone for this yet is I opened this studio here what is it like four years ago now or something like that in this location. OK. So my students are still very much on the young side. And since I take students as young as three and I take a lot of young students there generally I have a quite a young studio. I do have several teenagers but it’s not a huge demographic for me in my studio at the moment. As they grow up obviously it will be more and more. And I think this would work better with a studio that is largely tweens and teens. I could be wrong but I think they would appreciate it more and I think they would do better with it. I think it would be a fantastic idea to try though. So if you have enough teens and tweens or do you just think I’m wrong and you think it is great for 5 year old then. I think this would be an absolutely fantastic thing to do for your recital bring in a couple of musicians you know a guitarist and a drummer would do it doesn’t have to be a huge band but to bring them in and have your students play with them hopefully do a rehearsal beforehand and then play live with them. I think that would be such a buzz. It would be amazing. Another way you might spice up your Idol which I also haven’t done is to choose a bit of an unusual venue. There’s work best. I think you have a digital piano that you can bring with you and probably an amp to go with it so that you don’t have to rely on them having a piano because getting a wacky venue that has a piano already in it is going to be pretty tough and renting pianos hiring pianos is astronomically expensive. Maybe not where you are but certainly here it is just way outside of my budget so I would only do this with the digital piano. But again it’s something that I think would be fantastic either like a coffee shop or a local coffee shop that you make it more like a gig or just something completely zany you know. I think Becky Lauren did a recital in a cinema. I think she just different crazy places all the time. She is arraigned on the Facebook group so if you hang around Facebook you will have seen Becky Davia Lauren. She was also on Tim Tapon’s podcast and she is sort of representative, teacher representative I’m probably not using the right words but anyway she’s connected somehow to joy tunes which create the piano maestro. So that’s where I know her from. But she did one in a cinema. I think that could be cool. You could use all sorts of crazy places, anywhere you can think of that you can fit an audience in. You could try doing a recital there. It could be really really fun as you think about these various different ideas. I want you to keep in mind that the little touches make a big difference. You don’t need to do a really interesting theme plus a crazy venue. Plus a brilliant ensemble pieces with a band that is not necessary. Pick one or maybe two of these ideas and roll with it. It leaves you other things to dry in other years and it means people will genuinely appreciate the touch that you put in. You don’t need to do absolutely everything you just need to do one thing. And this goes for so much. I give this advice in so many different situations but it’s so true. One thing one thing makes a difference right. One new thing in your teaching are we try one new thing in your recital this year and see how it goes. And if you’re the type of person who gets nervous for trying stuff like this I totally get it. I have found the best way to approach that if I am nervous about something slightly crazy like if I’m using pompoms in an audience in the recital. I’m just honest in my welcomes reach. I’m pretty sure I said to the parents and this is a bit of an experiment I might have gone bonkers but I think it could be fun. So let’s give it a go. You say it like that people will try to make it work for you. You don’t need to worry about having everything perfect. People know you. They appreciate the effort you put in and if you’re nervous about something. Just be honest about it. It normally makes you feel better so I hope this has given you some food for thought when it comes to your next recital and that you can incorporate one of these ideas to make your recital that little bit more interesting. If you’re still in the stages of trying to figure out all the stuff you need to do the basics of recital then you need to go back to the previous episode that’s vibrantmusicteaching.comcom/20. The numbers 2 0. And there I take you through a step by step checklist towards your recital so that everything is in place and you can relax. I hope you enjoyed this episode and i’ll chattier next week on another episode of The Vibrant music teaching podcast. Registration is now open for the next free webinar for piano and other music teachers. You can find out more and sign up at a vibrantmusicteaching.com/sight. And that’s a sight where the G H you because this is all about sight reading. Can also just hop over to the colorful blog and you should seen a sign up form right there. And I look forward to seeing you live on that webinar and sharing my sight reading strategies with you.